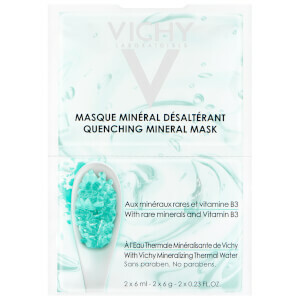 Vichy presents the Quenching Mineral Mask, a refreshing treatment expertly formulated to soothe and restore dry, dull and sensitive skin. 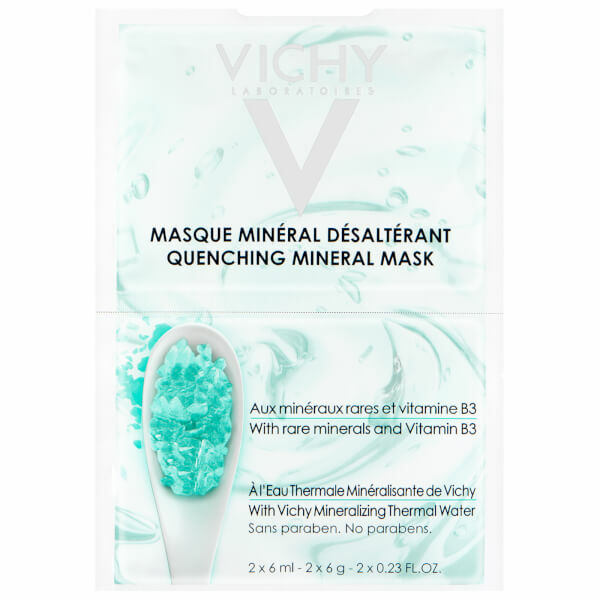 The mask features a gel-like texture and is fortified with Vichy’s exclusive Remineralizing Thermal Water to lock in an intense burst of moisture and enhance skin’s natural barrier, whilst Vitamin B3 soothes and nourishes to reveal a brighter and more even tone. An innovative blend of Hydrating Glycerin and Menthoxypropanediol provides a super fresh sensation similar to menthol, plus extracts of Green Tea, Jasmin and White Musk uplift the senses. Achieve an instantly revitalised and brighter looking complexion with this stimulating face mask. Tested on sensitive skin under Dermatological control. Hypoallergenic. Aqua, Glycerin, Alcohol Denat., Niacinamide, Dipropylene Glycol, Pentylene Glycol, Butylene Glycol, Peg-8, Peg/Ppg/Polybutylene Glycol-8/5/3 Gylcerin, Peg-60 Hydrogenated Caster Oil, Ci 61570, Carbomer, Triethanolamine, Phenoxyethanol, Ammonium Polyacryloyldimethyl Taurate, Tetrasodium Edta, Menthoxypropanediol, T-Butyl Alcohol, Parfum. F.I.L. C182661/1.